Home Xtra, Xtra read all about it... Is this the future of buying weed in New York? There are three medical marijuana dispensaries in Manhattan, but only one is designed with the airy minimalism of an Apple store. The others look and feel like doctors offices, but here, at MedMen, the owners would actually prefer if you shed the pharmaceutical associations that might come along with “medical marijuana,” which is legal here in New York state, and instead think of them as a “cannabis retailer.” It sounds fancier that way, more accessible, like you might just run into a “cannabis retailer” anywhere here in this city. Even though that’s not the case — yet, at least. On the sticky, humid afternoon of the last Wednesday in August, there were no dogs enjoying the inviting water bowl MedMen leaves right outside the front door. And inside there were no customers either. Dispensaries might be normal on the West Coast, but New Yorkers aren’t all that used to the idea of casual weed shops. For a store devoid of shoppers, though, MedMen still feels busy with activity and people. First, there’s the security — a group of old white men in striped polos who check IDs by the door. Customers must be at least 21 to enter. Usually, at this time in the afternoon, they’d also require a medical marijuana card, but today it’s quiet and the guard has decided he’ll extend their morning tour hours to the afternoon. Yes, in New York City people take tours in medical marijuana dispensaries. A shop clerk dressed in a red MedMen T-shirt under a red MedMen sweatshirt walks over, hands me a copy of Ember, MedMen’s in-house glossy magazine published in partnership with Paper, and guides me towards the row of wood tables that, much like in the Apple Store, carry all of MedMen’s products.They sell five strains that range from pure CBD to pure THC, and they’re specifically given generic names like Wellness, Harmony, Awake, Calm, and Sleep because according to New York’s laws brand names can’t be “coined or fanciful.” All of the product sits within the table, covered by a piece of glass because, again as per state law, you can’t touch anything. By the back wall there’s a glass window that looks out into a vault where all of the product is stored, almost like an aquarium for the plant. Staff pharmacists handle and distribute the product. Tucked inside Ember there’s a list of Manhattan physicians who can prescribe it. Weed dispensary or Apple Store? There are a lot of limits on what MedMen can sell at this point, and the clerk explains them all. When New York’s medical marijuana program began two years ago, patients needed one of 10 severe medical conditions to qualify for access. Now the list is up to 12. Currently, New York dispensaries can only distribute marijuana in the form of vaporizer pens, tinctures, and gel caps (topical creams and lotions were recently approved, as were powdered flower that’s vape-able, since combustion is still illegal). You can only purchase using a debit card or cash — at MedMen, there’s a velvet rope by the ATM to organize the line. Never once am I left unattended, so I chat with the shop clerk. When she applied for the job, she says, she thought it was for a regular clinic, like every other New York dispensary, but she was fine with the turn of events. It made sense. She described herself as a 10-year recreational user who was never addicted and who wouldn’t describe herself as a typical “stoner,” so she was happy to work on changing the stigma around weed, which is in large part MedMen’s goal: mainstreaming marijuana. “We want to approach this how Whole Foods or Apple or Tiffany & Co. would approach retail,” says Daniel Yi, the SVP of Corporate Communications and Investor Relations at MedMen. That’s how, over the past year and a half, the company has grown, exploded really, from 50 employees to 850. This year, MedMen became the first cannabis company valued at over $1 billion. They’re traded on the Canadian Stock Exchange. Roc Nation co-founder and CEO Jay Brown just joined the board of directors, along with former Los Angeles Mayor Antonio Villaraigosa. They have 14 shops around the country with two more on the way. But MedMen was actually founded in 2010 under a very different premise. Adam Bierman and Andrew Modlin had been running a branding, consulting, and construction firm in California when a dispensary owner — they call her the “blue-haired lady” — reached out for help. She was making $300,000 a month and hired them to advise her on how to double that. Her profits were so big they inspired Bierman and Modlin’s career change. A year later, they opened a dispensary of their own in Marina Del Rey, called it the Tree House, and quickly learned that their management and operations experience put them leagues ahead of competitors. In 2013, people from Massachusetts began reaching out because the state had started a medical marijuana program. The application for a license required each company to demonstrate operational expertise in the field, and they were calling Bierman and Modlin for that expertise. Enough people contacted them that they closed the California Tree House and shifted gears once again to managing and consulting for existing marijuana retailers. Bierman and Modlin advised other companies on hiring and handling inventory, and they spent the next two years building software systems to implement in dispensaries. In 2015, with all of the software in place, MedMen entered its next phase and opened a store in West Hollywood. The company still offered their consulting services to younger cannabis brands and had also built up a venture capital wing for investing in up-and-coming markets, but the focus, now, was back on retail. 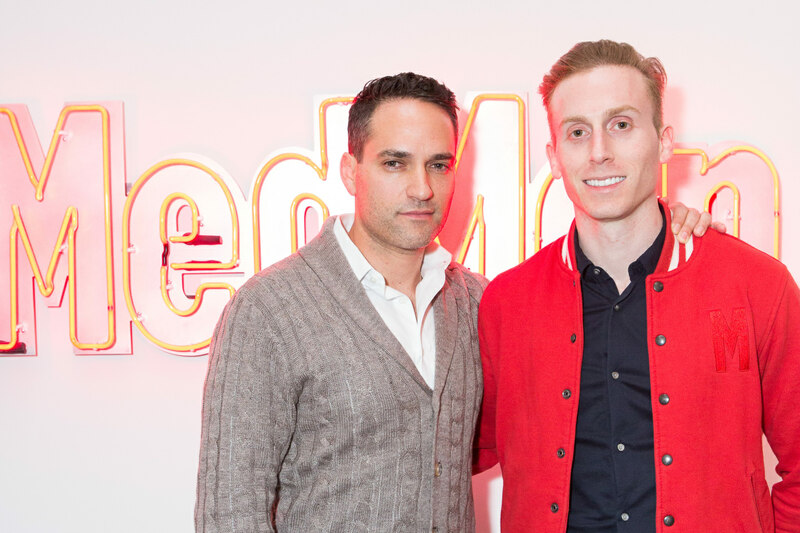 MedMen’s co-founders Adam Bierman and Andrew Modlin. Which is why, when medical marijuana was legalized in New York state in 2016, MedMen was already in demand. In the initial legislation, New York’s program planned to offer licenses to just five companies, known as registered operators, who would then be granted permission to both cultivate and sell in the state. Each could open four dispensaries in predetermined locations decided by the Department of Health, in order guarantee a diversity of location. Just three dispensaries were allocated to Manhattan. One of those was Bloomfield Industries, which opened thanks to a $4 million loan courtesy of founder’s mom. But after a series of poor business decisions, like opening a cultivation facility in Long Island City where real estate was far more expensive, it ran into financial trouble. So in October of 2016, Bloomfield hired MedMen as consultants to help streamline their operations, improve production, and upgrade overall patient experience. A little over a year later, on the auspicious date of April 20, 2018, the Manhattan store arrived with a grand opening party. MedMen attempted a big splash, but it’s been a slow start. 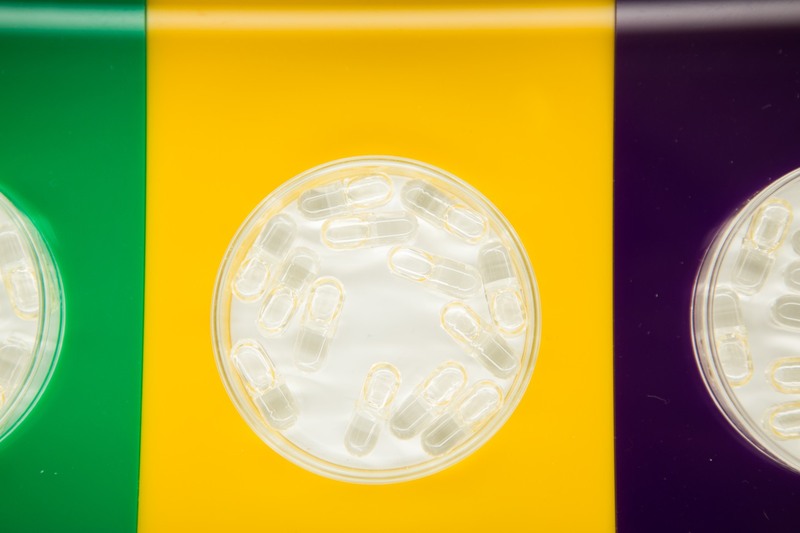 Many activists consider the state’s laws unusually and unnecessarily restrictive for both patients and the companies doing business. So few medical conditions are approved that very few people can even buy and when they can, the state has kept the THC levels so low that it’s often ineffective as treatment. Meanwhile, New York will only grant registered operator licenses to 10 companies, and just to apply costs something like $200,000, plus you need a $2 million bond, with all of your properties already identified or leased. While California’s medical marijuana program began in 1996 with dispensary operators who were also activists — think the “blue-haired lady” — in the city of Wall Street, approved dispensaries are more likely run by investment bankers and pharmaceutical executives. As activists work to get more flexible dispensary laws, the city has moved ever closer to legalizing adult use. This July, the Health Department released a 75-page report concluding that the state should create a regulated, taxed marijuana market. Cynthia Nixon, who’s running for governor with a full legalization platform, has pushed the incumbent Governor Andrew Cuomo to lean ever more progressive on the issue. Starting on September 1, the New York Police Department stopped, for the most part, arresting people for marijuana possession, instead handing out tickets that come with fines of up to $100. 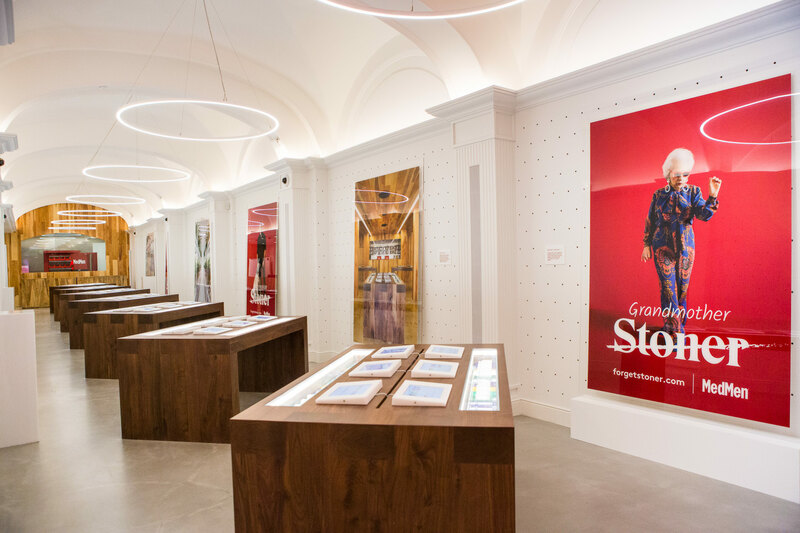 As it stands now, the MedMen store in Manhattan acts more as a curiosity and weed workshop — a living, breathing lesson in normalization. Far from being the center of hot Manhattan retail, the store is sandwiched between a GNC vitamin shop and a chain bakery. At just a few blocks from both the Empire State Building and Grand Central, it’s more a site of suits and tourists, than a true shopping destination, like Soho. That works for them, though. The point, really, is to gain the attention and trust of type-A businessmen. People who might not yet consider replacing an after-work beer with an after-work joint because it’s still too illicit, but might one day be convinced otherwise by the right “cannabis retailer.” It’s less about nailing the perfect boutique experience than reaching the masses as quick as they can, while they’re still early. Soon, MedMen will break ground on a 45,000 square foot cultivation and manufacturing complex in upstate Utica, New York, that’s an exact replica of the one they’ve built in Nevada and call the MedMen Mustang. It’ll include a 19,000 square foot hermetically sealed, environment-controlled greenhouse, a manufacturing wing with extraction machines, and an industrial kitchen to cook and bake edibles, all of which they’ll bring onto the market as soon as they’re approved by the state. In the Manhattan store, the walls are perforated with rows of small holes that at first look like a questionable aesthetic decision, but are actually there so that new racks and shelves can be installed within hours, as soon as new products are permitted. There’s space for refrigerators, which they’ll set up once they can sell edibles and infused drinks. The store looks empty now, so that it can fill up later. MedMen awaits, at the ready.